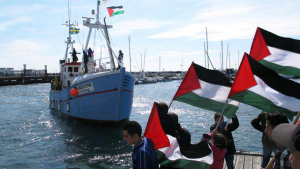 Freedom Flotilla III’s Marianne av Göteborg on its way to Gaza. Israeli forces intercepted the Gaza-bound boat Marianne late Sunday night, in what the Israeli Defense Forces said was a short operation free of any casualties. The boat is currently en route to Ashdod port. Fighters from the Shayetet 13 unit searched the boat after the successful takeover. According to military sources, the ship is expected to dock in Ashdod within the next 12-24 hours, depending on weather and sea conditions. After arriving in Ashdod, they will be interrogated before being escorted to Ben-Gurion Airport and flown out of Israel. The Swedish boat, which on Sunday afternoon was 150 nautical miles from the Gaza Coast, is carrying 20 activists, among them MK Basel Ghattas (Joint Arab List) and former Tunisian president Moncef Marzouki.